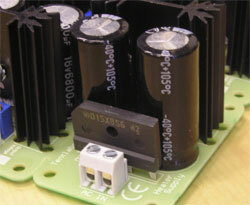 This module is intended to supply the heaters of indirectly heated tubes. It is compact, low drop, does the full job from AC-in to DC-out covering an output range from 2.5V to 13V. They provide clean switching and inhibit low voltage drop. 2 filter capacitors (6.800uF each) smooth the voltage. A discrete design, low drop voltage regulator feeds a power transistor at the output. 5 years of warrantee are valid for the heater supplies, assumed they are built in according application information. Look at the [to be written] for detailed mounting instructions. Download a fine example of an alternative application here. Though this is a product which if handled properly is save, it is possibly surrounded by high voltages. Working with high voltages requires safety measures and professional behavior. Tentlabs takes NO responsibility for accidents resulting from improper usage or handling.